1) Indicating what the window is about - since you know what a coal mines looks like, you can identify the coal-mine window without reading. They act as symbols for what kind of window it is. 2) Indicating which of a bunch of objects it is - Even if you go to location, if there are several coal mines close to each other, it's sometimes hard to see which is which. If there is a tree next to one of them, it's far easier. 3) Keeping them in view. Especially with vehicles, you sometimes want to make sure if they are going fine or need to wait unreasonably long in some parts. 4) Going to location by clicking on the window. A) They change size depending on the pakset. There already were problems with that in the past (eg. for a while, alerts in p192 were written vertical since the space was just enough for the image), and even if it's thought of and does not lead to bugs, it's a bit weird to design around it. B) They are really old-fashioned. Thats not per se an issue since the whole game is old-fashioned in a way, but while you can paint other parts in fresh colors (eg. how the menu is done in p192c) there is pretty much nothing you could do with those images even if there were settings for them, as any kind of border would take up too much space in p192 or would be too big in comparison to the image in p64. C) They are not really that great for most of the 4 applications given earlier. If you really wanted to have a symbol for quick identification, it would be better to have a dedicated symbol which could have the same size among paksets, rather than several buildings which do the same, but look different. If you want to know which of a bunch the window belongs to or keep track of it, it's too small. You should be able to see more of the surroundings for that. To go to location is what I would use them for most, but that's more of a habit as there are other options to do that. What's my Idea? Make it bigger, but optional. This would be the window without that image, but instead, you have a bar in top where you can open a larger version of the location view. Note that the arrangement of elements is currently worked on by Dwachs, this is but an old version. 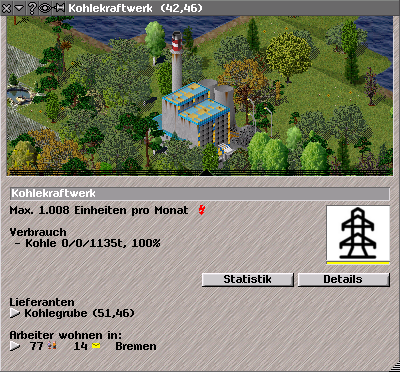 If provided, where the small image was I'd add an optional "factory symbol" (always 64x64, provided by the pakset similar to menu buttons to identify a factory or several similar factories) and perhaps a go-to-button in the same size - though that could be a pure GUI element rather than a pak element. In pak64, you probably get to see the whole building, In larger paksets, you at least wouldn't see less than you do now. That part of the windows should be expansible downwards and keep the building centered. Since the GUI is currently under construction, it's probably the perfect time for a change like this. I often use the small image to go to the factory in question, so it should be there by default. I know there is a go to button in the title bar, but it is much more difficult to hit. (I often end up hitting the help button, which causes the game to freeze for a few seconds.) Seeing a little bit more of the surroundings for a building doesn't help me much, but a minimap where only the factory is marked would. A bigger view for vehicles might however be useful. Ok, I also use the small view very much as goto button instead trying to hit the other buttons. Especially, when testing on a tablet, that was much more handy than trzing to hit the small things in the window title. However, this is only my personal taste. I would like to hear more options. It's not a new idea, no. But if someone made a new game with a new UI from scratch, they are much more likely to use the full window width for such an image or not using one at all, rather than putting a square of arbitrary size floating in a corner. It's not modern per se, but it can be integrated in modern visuals. I completely agree that it's most useful for that, and if that was to go without replacement, chances are people would complain a lot. However, I'm not sure how well-documented clicking on the image to go to location is, and how easy it is to grasp for new players. A dedicated large goto-button in the same location would be as easy to hit, easier to find, and could be a GUI-Element (growing largers/smaller as other elements do, having the same size in each pakset, therefore being easier to account for). But if someone made a new game with a new UI from scratch, they are much more likely to use the full window width for such an image or not using one at all, rather than putting a square of arbitrary size floating in a corner. It's not modern per se, but it can be integrated in modern visuals. That depends. I don't think the square was arbitrarily sized when it was made. It was 64x64 pixels, the size of the graphics in the game. Later someone wanted and someone made Simutrans able to use different sized graphics. However, the GUI elements didn't scale along correspondingly, probably because the GUI was constrained by the same screen size regardless of the pak size. The image is useful for recognizing what kind of object it is. I would perhaps rather have expected it to be an icon, not a live view with such a narrow field-of-view as to be almost useless. The one benefit over just an icon is that you can get a quick view of the traffic situation for a simple bus stop or around a vehicle, and to some extent see where a vehicle is. In the latter two cases, I might have several vehicle windows open, and in the last one, also the line list window and a depot. There simply isn't room for a full width view in the vehicle windows. I think the best solution would be to have the size of the view fixed by the theme, and it should show one tile, scaling if necessary to fit. Unfortunately, Simutrans can't to arbitrary scaling, but I think pak sizes mostly fit the zoom scales in Simutrans anyway. I'm not sure how well Simutrans is able to show different scales in the same frame. It can obviously handle it when one of the scales is 1:1, since that is how these views are now. Scaling the preview down to pak64 equivalent sounds good. However the original idea is very nice too. I would vote for both. To have a scaled images as goto button, and an optional resizable window with larger view either at current zoom or at 1:1 scale. This is very alike RollerCoaster Tycoon, and it's pretty cool on RCT. Scaling the preview down to pak64 equivalent sounds good. That's too small for pak128 and 192. I disagree. I play mostly pak128 size and zoom out for most of the time. I think it would be better than some icon for a goto button. I personally prefer the present behaviour, so hope that any change will be optional. I think the best solution would be to have the size of the view fixed by the theme, and it should show one tile, scaling if necessary to fit. I don't think the theme should decide the size of that element, at least not directly. It could be dependent on other GUI settings as larger GUI-Elements and larger text should probably scale up the window size, which would in turn leave more space for that element. But if the Theme directly sets the size, you'd have the standard Simutrans Theme delivered with the game, which would likely set it to p64 size, much too small for p192; and set-specific themes like the p192c-theme would likely set it for their sets size. It would be the same problem with extra steps. There simply isn't room for a full width view in the vehicle windows. IIRC, there are some windows you can reduce to just the title bar, so you'd have them around for easy access but they don't take up space (I might be wrong, it's not a feature I'd use). What if both the "Information" part of a window and the "graphic" part were expandable and retractable? If you have the space, you can expand both parts and have the same expierience as now, but with more surroundings in view. If you don't, you can decide if you are interested in information about the vehicle in cold numbers, or it's traffic flow. This googled image shows a bug that existed for a while because alert windows had a fixed width independent of the pak size. Now it's fixed by making the window larger, leaving a lot of empty space below the text. If instead the image would go over the full width and the text below it, it would effectively save space. 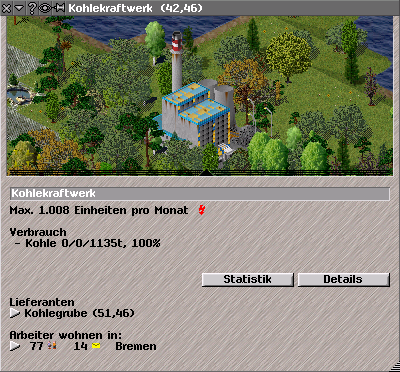 The Simutrans engine would allow for showing a downscled image in the world view (thats the name of that icon), i.e. always scale the set so it is 64x64 size, regardless of the map scale. I.e. the vehicles in the depot do no longer scale with zoom factor as the did asome time ago. I need both image and at least the most of the information (line, next stop and cargo details), without taking up more space than now.